Everything You Think You Know About Healthy Eating is Wrong (and it’s Making You Fat and Tired)! Okay – so nutrition and diet info is everywhere! And each expert tries to lead you in their direction because they know best and their advice is going to help you. Right? The “calories in, calories out” philosophy (i.e. how much you eat) is being drowned out with research on other factors that may be just as important. Don’t get me wrong limiting calories, carbs or fat can certainly help you lose weight but that’s simply not the only factor for long-term weight management and maximum energy for everyone. Ideally, you need a varied diet full of minimally-processed foods (i.e. fewer “packaged” “ready-to-eat” foods). This simple concept is paramount for weight management, energy, and overall health and wellness. NOTE: Ayurveda would recommend that all fruits are eaten alone, as a snack (at least 2 hours before our after a meal), given it digests at a much quicker rate that most other foods. This will help your digestion, and avoid fermenting the fruit in your belly! A colourful array of fruits and veggies at almost every meal or snack. You need the fiber, antioxidants, vitamins, and minerals. Enough protein. Making sure you get all of those essential amino acids (bonus: eating protein can increase your metabolism). And remember, there are lots of great plant based options for getting protein. From lentils, legumes, seeds and nuts, and even those bright green veggies! Healthy fats and oils (never “hydrogenated” ones). There is a reason some fatty acids are called “essential” – you need them as building blocks for your hormones and brain as well as to be able to absorb essential fat-soluble vitamins from your uber-healthy salads. Use extra virgin olive oil and coconut oil, ghee; eat organic egg yolks, and get grass-fed meats when possible. You don’t need to overdo it here. Just make sure you’re getting some high-quality fats at each meal. From an Ayurvedic perspective, this is the most important thing we can do to help our digestion and support health weight and good energy throughout the day. 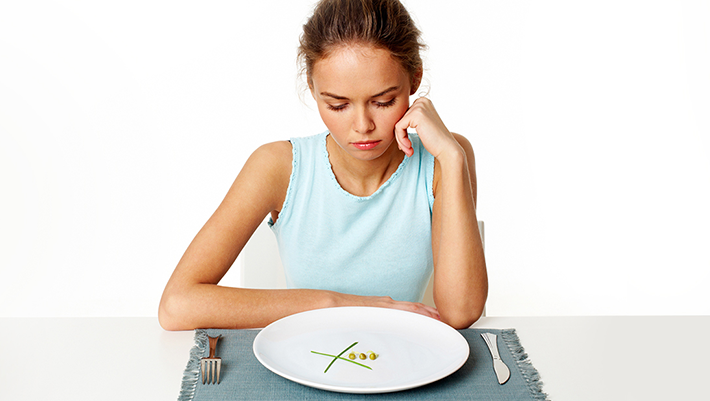 This can also help with weight management because eating slower often means eating less. Did you know that it takes about 20 minutes for your brain to know that your stomach is full? Yes, smoothies can be considered healthy and a super easy and tasty way to get in some fruits and veggies (hello leafy greens!) but drinking too much food can contribute to a weight problem and feelings of sluggishness. In Ayurveda (the ancient life science from India, to support overall well-being and balance), the traditional way of making a smoothie could negatively affect our health and digestion. In short, Ayurveda would ideally look to warm, cooked foods with to support the digestive fire (known as agni). By using cold, uncooked and many ingredients in our smoothies, this confuses and often dampens our digestive fire, not allowing for the nutrients to be absorbed properly. Don’t get me wrong a green smoothie can make an amazingly nutrient-dense meal and is way better than stopping for convenient junk food. However, there are some Ayurvedic recommendations to support the digestion, and help maintain weight and overall good health. Consider the following tips to make your next smoothie “ayurvedically”! Warm it up! Use fresh (not frozen) ingredients and warm nut milks as the liquid base (avoid using ice). Spice it up! Use spices like fresh ginger, cinnamon, cardamon and turmeric which have warming qualities, and will help to heat up the rest of the ingredients and support good digestive fire! Consider the energetics. Consider the energy of the food (ideally you are using ingredients that are as “local” and fresh, so the energy hasn’t be lost. Also, consider the energy and time of day. Ideally having a cold smoothie in the warm summer months and a warm smoothie in the cold/dry months. Also, remember not to gulp it down too fast!